At Fresh Plus we like to keep our beef local. Which is why we have partnered with Heartbrand beef out of Flatonia, Tx. Located just over 73 miles from Austin, Tx. Heartbrand Beef has the largest herd of certified Akaushi cattle in the United States. Akaushi ( Japanese Red Cattle ) is a breed of Wagyu beef that originated in Kumamoto, Japan. Akaushi beef is similar to other well-known breeds of Wagyu beef such as Kobe beef. However, Kobe beef is produced exclusively in the Kobe region of Japan and contain specific bloodlines of Japanese black cattle. Unlike Kobe beef, however, Akaushi beef was developed to withstand the challenging climate of Kumamoto. Making it, in my opinion, the perfect breed of wagyu beef to raise here in central Texas. We believe the Akaushi beef produced by our friends at Heartbrand beef, is some of the best in the world. Heartbrand’s wagyu beef has earned a prime quality grade thanks to its intense marbling. It’s because of this marbling that Akaushi beef taste better than any other beef you will find in the Austin market. It’s also because of this marbling that Akaushi beef has such a high ratio of heart-healthy monounsaturated fats. 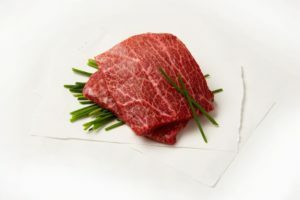 In fact, according to the American Akaushi Association, the marbling in Akaushi beef has a higher percentage of monounsaturated than any other beef in the United States. Akaushi beef is also a good source of healthy Omega-9 fatty acids. Additionally, these fatty acids are also what gives Akaushi its unique buttery taste. The Akaushi beef you will find at our Fresh Plus stores are all natural and free of antibiotics and Growth Promotants. Our goal is to provide our customers with the best tasting locally sourced natural beef in Austin, Texas. That said, We believe the Beeman family of Heartbrand beef produce the best tasting all natural wagyu beef in town! Read below to check out their story and a little more about Akaushi beef!